It’s easy to think you will never smile again if you are missing teeth. It’s easy to think you may never get to enjoy the foods you love if you don’t have your teeth. The truth is, you can have your smile back, and regain your chewing ability with the right denture. Today’s dentures are natural-looking and fit well. Dr. Steven Christensen at 4 Dental Health in Layton, Utah offers a full line of dental services including many denture options to help you. If you are trying to go without tooth replacement, it’s time to regain your smile and your enjoyment of food. You can choose from a variety of dentures, depending on how many teeth you need to replace. A conventional denture, which is created after your tissue has healed completely at around 6 to 8 weeks; these dentures are sturdy and built to last, and you only have to get used to wearing one denture. An immediate denture, which is placed immediately after your teeth are removed; immediate dentures allow you to leave the office with immediate tooth replacement. A conventional denture is created later after your tissue has healed completely. An overdenture, which is made to be snapped in place over dental implants or existing tooth roots; implant-supported dentures help to maintain the bone in your jaw and the implants add more stability. Conventional partial dentures, which are meant as permanent tooth replacement; these appliances are sturdy, fit well, and are built to last. Transitional partial dentures, which are meant as temporary tooth replacement while you are waiting to get dental implants. You deserve a great smile, and the right denture can help you achieve it. To find out more about dentures and other restorative and cosmetic dental services, call Dr. Steven Christensen at 4 Dental Health in Layton, Utah today! Dentures replace missing teeth and complete your smile. They also restore normal biting and chewing functions, improve speech, and provide support for sagging facial muscles due to tooth loss. Several types of dentures are available. Your dentist can recommend the right type of dentures for you. In Layton, UT, dentures are available at 4 Dental Health where Dr. Steven Christensen can fit you for the right type to complete your smile. There are two main types of dentures in Layton: partial and full dentures. There are also different types of full and partial dentures. Partial dentures are used when you still have some natural teeth remaining and do not need to replace all of your teeth. The natural teeth are left in place, while the partial dentures fill in the gaps where teeth are missing. Full dentures are used when there are no natural teeth remaining and all your teeth need to be replaced. Removable Partial Dentures- For this type of denture the replacement teeth are attached to a plastic base resembling natural gums. The removable partial denture attaches to your remaining natural teeth with metal clasps or precision attachments. A primary difference between metal clasps and precision attachments is that metal clasps are readily noticeable, while precision attachments are barely visible and more discreet. 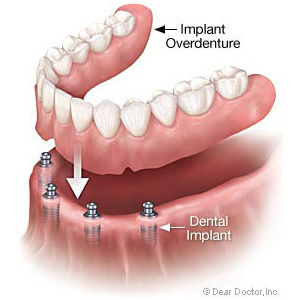 Overdentures- These are another type of removable denture. They can be used whether you still have some natural teeth or none remaining. This type of denture is held in place by either dental implants or your remaining natural teeth. The teeth or dental implants provide support and stability for the dentures. If the overdentures will be held in place by your teeth, the dentist first prepares the teeth to ensure they can provide sufficient support and stability. Full dentures/Complete dentures- They are used to replace teeth when no natural teeth remain. Two specific types of full dentures are immediate and conventional. Immediate dentures are placed over the teeth right away or immediately following extraction of any remaining damaged teeth. Immediate dentures are usually intended to be worn temporarily while the gums heal. Conventional dentures are worn long-term but cannot be fit in place until the gums have healed from extraction, which is usually after six to eight weeks. Different types of dentures are available to best suit your needs. Your dentist can recommend the right dentures for you. To find out what type of dentures are right for you, schedule an appointment with Dr. Christensen, your Layton, UT, dentist for dentures, by calling 4 Dental Health at (801) 889-1044. Restoring your smile is easy when you wear dentures. Layton, UT, dentist, Dr. Steven Christensen, shares information on the various types of dentures available. Immediate dentures provide an excellent option if you don't want to be toothless while your mouth heals from a tooth extraction. Before your teeth are removed, an impression of your mouth will be taken and used to create your dentures. The new dentures will be placed in your mouth immediately after extraction. Immediate dentures can help ease the adjustment process and ensure you look your best. They will need to be readjusted periodically as your mouth heals. When you've lost all of your upper and lower teeth, you'll want to consider full dentures. The dentures are constructed from molds of the ridges of your mouth and rest against your gums. During the first several months that you wear your full dentures, you may need to return to Dr. Christensen's Layton office a few times for adjustments. The ideal fit will prevent the dentures from slipping and irritating your gums and will also make it easier to speak clearly. Because your teeth roots are responsible for keeping your jawbone strong, it doesn't make sense to remove teeth with healthy roots, even if they're damaged. Overdentures are designed to fit over damaged or broken teeth. Implant-supported dentures are attached to dental implants, tiny screw-like posts that bond to your jawbone. Because the dentures are firmly attached to the implants, biting and chewing are more comfortable. One arch of implant-supported dentures is supported by about six to eight implants. Partial dentures are a good option if you still have remaining teeth but need to fill a gap in your mouth. They consist of a row of artificial teeth connected to hooks that attach the removable dentures to your teeth. Not sure which type of dentures is right for you? Call your Layton, UT, dentist, Dr. Steven Christensen, at (801) 889-1044 to schedule your appointment.